Hence the Daily News is serialising the Chronicle of LTTE Terror taken from our own archives which would remind our readers how it all began. An awareness of the chronology of terror would help us prevent the recurrence of such terror and frustrate any attempts by misguided elements to repeat history to suit their evil designs. It was not simple terror. Nor was terror sporadic. It was all pre-planned, pre-determined, well-calculated terror. The victims were innocent people. Though it is too many innumerate we would like to recall the major episodes in the Chronology of Terror. 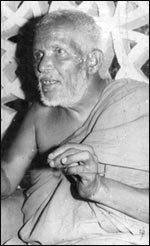 On August 8, 1995 the Ven Matara Kithalagama Sri Seelalankara Nayake Thera popularly known as Dimbulagala Hamuduruwo among the poor peasantry he had worked to ameliorate was killed by the LTTE terrorists when he was on his way to visit a farm belonging to the temple. Dimbulagala temple of which he was the incumbent was not a luxurious or affluent affair but a rock cave in which he had found shelter living a very hard life becoming of the monks that followed the teaching of the Buddha who said, go forth O monks for the greater good of the masses, give them comfort in the spiritual realms. Yet this unorthodox member of the Buddhist clergy was concerned with more mundane matters but in fact he had spent his life to uplift the poor and disfranchised peasants of the east who had been cheated of their birthright living a humdrum life, hand to mouth existence in the remote hamlets surrounded by the jungle in chill penury. When the Ven Kithalagama Seelalankara visited Dimbulagala he found illiterate and impoverished villagers who had been living in the locality for decades in poverty but he found something very strange. When he asked them for their names like Piyadasage Selvam or Jayaratnege Nathan, the first names were Sinhalese but the second name was Tamil. When he delved deeper into the strange admixture of people’s names having two ethnic identities he asked them how they had such names. Then he was told by the illiterate peasants at least most of them had not gone to a school the Thera was told that the Tamil public servants who worked in the Registrar General’s Department at the nearest town had recorded their names like that in their birth certificates. The Thera decided that he should live among these hapless peasants and work for their amelioration. At that time several decades back the majority of the business community of Trincomalee was from the southern province and the Thera told them about the plight of the Sinhalese peasantry that was being Tamilized due to their extreme poverty and ignorance. He told the businessmen they should help the poor people and collected sufficient dry rations to help them and got them to gradually start cultivation and methods of improvement of their economic condition. The Ven Kithalagama Seelalankara Nayake Thera lived in rock cave without the comfort of the usual Buddhist temples but worked day and night to improve the living conditions of the poor peasants around Dimbualagala. He was certainly a thorn in the eye of the LTTE and other separatist terrorists who wanted the ethnic cleansing of the eastern province leaving only Tamils in that province. 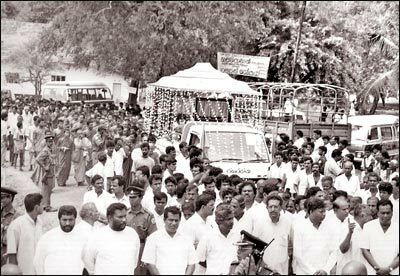 On this day about 100 LTTE terrorists raided Dimbulagala and the Nayake Thera was leaving the rock cave temple to visit the farm that fed poor peasants in his vehicle when terrorists hiding in the jungle lining the road opened fire with automatic weapons killing him instantly around 7.15 a.m. They next raided the village and killed 42 villagers all unarmed civilians including women and children devastating a community of the poorest of poor who were being gradually uplifted by the efforts of the Nayake Thera who had dedicated himself to ameliorating the poor peasantry with a great degree of success. In two separate incidents in the East yesterday morning, the highly respected Dimbulagala priest and his driver and 42 civilians were killed, military spokesman Brigadier Sarath Munasinghe said. He told the weekly press briefing that Ven. Matara Kitalagama Sri Silalankara Nayake Thera and his driver Anton Silva were shot and killed at 7.15 a.m. when he drove to his fruit and vegetable farm two and a half kilometres from the temple, in Polonnaruwa district. An acolyte, H. Bauddhasara, who too was in the vehicle, was critically injured and is now receiving treatment at the Polonnaruwa hospital, Brigadier Munasinghe said. He said the identity of the killers had not been established and a team of police officers had been flown to Polonnaruwa to investigate the slaying. The 42 civilians were killed in the fishing village of Kallarawa, north of Trincomalee and 10 kilometres from Pulmoddai. Seventy five families lived in that village and of the 42 victims, 24 were males, 12 women and 6 children. Five of the injured are receiving treatment. Over 100 LTTE terrorists had entered the village in the early hours of the morning, fired at the small army camp on the borders of the village and attacked the village, killing the people and setting fire to their cadjan sheds, Brigadier Munasinghe said. Question: Were the soldiers injured? Question: Where were they when the army camp was fired on? Answer: They usually go out to guard the approaches to the village. Question: How were they attacked? Answer: We have not got those details yet. The Dimbulagala priest went out yesterday morning to visit the temple farm. The policemen providing him security advised him against going out without security. The priest told the policemen that security was not needed, Brigadier Munasinghe said. He said the priest was provided with a 10-member police security team. They lived with him in the temple. The priest used to go to the farm without security. Yesterday morning his vehicle drove along the main road and turned into a by-path and had proceeded about 200 metres when it was fired upon. “Some people who had stayed hidden fired at his vehicle. It must have been travelling very slow,” Brigadier Munasinghe said. Answer: The IGP has sent a special investigation team to investigate the killing. We have to wait till they report on the incident. Question: Has not the priest asked for protection? Answer: He has been asking for protection for the last ten years. Question: Was he not provided military protection earlier? Question: Why was it withdrawn? Answer: Because the services of the military personnel were needed to fight the LTTE. He was provided police security. Question: Why did he go without security? Answer: He has been like that always. He goes to his farm without protection. Question: Does he go to the farm in the mornings? Answer: He goes at various times. Brigadier Munasinghe said Dimbulagala was an area where only Sinhala people live and priest would have felt safe to go without security. But it was on the border of the Thoppigala jungle and the priest feared LTTE attacks from the jungle. Question: Was he under threat by the LTTE? Answer: He had feared attacks by the LTTE. Question: Can you positively rule out that the killing was not the work of the LTTE? Answer: I cannot possibly rule it out. He said the mowing of the civilians in Kallarawa was the work of the LTTE. Question: Is the LTTE avoiding attacking the army and turning its attention on the civilians? Answer: There seems to be a change in their attitude. Question: Are they frightened to face the army? Answer: In the Eastern province they are in the jungles. We know where they are and are on our way to meet them. Brigadier Munasinghe said curfew was declared in the villages around Palaly camp to warn the civilians to keep out of that area. If by any military action they get injured, then the blame will not be on the army. 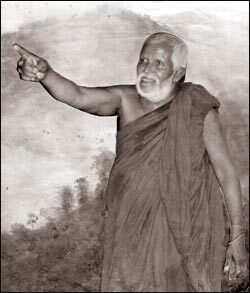 Widely hailed as an outspoken and fearless leader, Dimbulagala Nayake Thera worked tirelessly to forge Sinhala-Tamil unity in the border villages. He sought those in distress and provided succour. 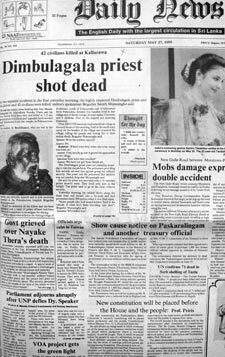 Within hours of the killing, several thousands of mourners thronged the Dimbulagala temple to pay their respects to the slain prelate, reports said. At least 21 people were killed and 55 injured when a powerful bomb hidden in a handcart piled with king coconuts, exploded outside the Torrington Square office of the Chief Minister of the Western Provincial Council shortly before 11 a.m. yesterday. An eyewitness, Kusumawathie, said she saw a man pushing the cart moments before the explosion. A security guard at the SLBC said that the he had signalled the man to stop and as he paused, the bomb went off. Another eyewitness who is also a king coconut seller said that the handcart man was a stranger in that area. The blast wrecked the front section of the domed building at Torrington Square strewing the area with bloody mutilated bodies, broken glass and rubble. Some bodies, their limbs torn off, were laid out on the lawn in front of the building. Chief Minister Susil Premajayantha was about to start a meeting elsewhere in the building when the blast went off. He escaped unhurt. It took a few moments for stunned officials to realise what had happened. Many of the Chief Minister’s staff in the front portion of the building had been injured by flying shrapnel. Most of the dead had come into the office either to see the Chief Minister or transact other business. Some senior officials at the Chief Ministry were among the injured. The blast which was heard in many parts of Colombo caused a large stairway cave in and was heard within a radius of about two kilometres. Some people found their doors blown inwards and cooking pots were knocked off stoves. A government analyst department official said that the explosion had been triggered off by a time bomb and had gone off before it reached the intended target. Police suspected that the blast was the work of two LTTE suicide bombers. The cart was being pushed in the direction of the SLBC and the Rupavahini Corporation which may have been targeted, some sources said. Police said that they suspected that one of the bodies blown some distance away may have been that of one of the bombers. Hundreds of office workers from nearby government buildings rushed out at the sound of the explosion but were kept away by the Security Forces. Mr. S. Vidanapathirana, Assistant Director of Provincial Councils, said that the Chief Minister and some other officials were at a meeting in the building when they heard the explosion. He rushed out of the room and found several members of his staff lying injured at their desk. There were 13 dead bodies in the lobby, some badly mutilated. DIG (Colombo), H. M. G. B. Kotakadeniya said that the evidence pointed to an attack on the SLBC/Rupavahini buildings. The SLBC sentry had said that the man pushing the handcart was dressed in white. Police believe that while the explosion was not powerful enough to have seriously damaged either the SLBC or Rupavahini buildings, the terrorist strike may have been designed to boost the sagging morale of the LTTE. Fifty two persons most of them seriously injured in the Torrington Square bomb blast were admitted to the Accident and Trauma Unit of Colombo General Hospital yesterday morning. Five of them found in a critical condition were later transferred to the hospital’s Intensive Care Unit (ICU). Another five including one woman found dead on admission were sent to the hospital mortuary, official sources said. Some of the injured to whom this reporter spoke at the hospital were teachers who had come to the Western Provincial Education Ministry regarding their transfers. Some others had been waiting to see Chief Minister Susil Premajayantha who is also the Provincial Education Minister, either seeking jobs or redress to various personal grievances. Health Minister A. H. M. Fowzie and Health Services’ Director General Reggie Perera were at a discussion with a Japanese delegation at the Ministry, when they learnt about the bomb blast. Suspending the talks, they immediately rushed to the hospital to ensure proper care for the injured. Accident Service Director Dr. Hector Weerasinghe, Chief Matron Ms. Sumana Perera, medical students and medical teams had thrown themselves into a well coordinated effort within minutes to meet the emergency. “We have a disaster preparedness plan which we put into operation within minutes and it worked smoothly,” a hospital spokesman said. Mrs. Kumudini Silva, a teacher of Holy Family Convent, Dehiwela who had sustained an eye injury said she called at the Chief Ministry to see the Provincial Education Ministry secretary. “I had planned to go aborad on August 30 and wanted to get some papers signed by the secretary. The secretary was in conference with the Chief Minister and I was waiting outside his first floor office when I was jolted by a sudden explosion. A flying glass piece struck my eye as I was rushing out,” a visibly shaken Kumudini recounted. Kumudini had lost her purse, national identity card and her leave papers. I would consider it a great favour if the finder of these despatch them to my school address,” she said. S. P. Upali Padmasiri, a teacher from Rajagiriya had been waiting to see the Chief Minister regarding a transfer he had asked for. “I heard the blast and the next thing I realised was that I was lying on the floor,” he said. Padmasiri who was lying on the hospital bed with a bandaged leg said that he could not say how he sustained his injury. R. A. P. C. Ranatunga, another from Mudungoda Maha Vidyalaya, Anuradhapura who had sustained a head injury too did not know what caused his injury. “I may have been injured by shrapnel. But all I remember is that I was lying on the corridor of the first floor,” he said. Among the hospitalised injured were two more teachers Deepika Atukorale and Kamala Amarasekera swathed in bandages. Police investigating yesterday’s Independence Square explosion believe that the man who was trundling a handcart piled with king coconuts in which a bomb was hidden had been living at a Narahenpita lodge for two years. Another king coconut vendor who lived in the same place had been questioned by police, DIG (Colombo) H. M. G. B. Kotakadeniya said. Some useful material had been elicited. The names of the two men have been withheld. The DIG said that the direction of the investigation pointed to an LTTE suicide bomber.